9/11 Truth: America is Ready! 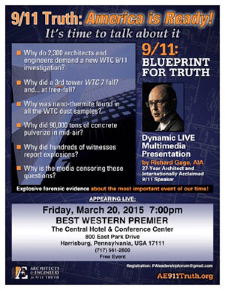 AE911Truth founder Richard Gage will be giving three live multimedia presentations on the WTC 9/11 evidence in Harrisburg, Scranton, and Newfoundland, Pennsylvania. The first presentation will be on Friday, March 20, at 7:00 PM at Harrisburg's Best Western Premier, The Center Hotel and Conference Center. The Four Points by Sheraton in Scranton is the scene of Gage's second presentation, to be made on Saturday, March 21, at 2:00 PM. Hosting his third and final presentation on Sunday, March 22, at 2:00 PM will be The Sanctuary Church in the village of Newfoundland, approximately 25 miles southeast of Scranton. To read an article introducing these three free events, click here.